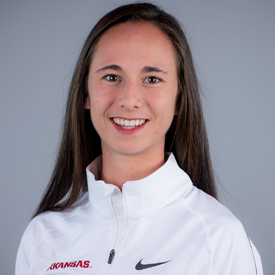 Arkansas career began at the Cowboy Duals (Sept. 1) where she was the top performer with a time of 10:35.50 … In her next meet, the Riverside Invitational (Sept. 17), she finished fourth overall and third for the Razorbacks with a personal best at 20:30.50 … Furthered her season improvement with another personal best in the Chile Pepper Festival (Oct. 1) clocking a 16:36.00 … Competed in the Pre-Nationals meet (Oct. 15) posting 21:22.60, finishing as sixth-best for the Razorbacks, good enough for 95th overall … A 23rd overall finish helped Arkansas to another SEC title at the SEC Championship (Oct. 28) with a time of 21:13.90, good enough for eighth-best for the Razorbacks … Earned All-Region honors by placing 15th overall at the NCAA South Central Region (Nov. 11), finishing as fourth-best for the Razorbacks at 20:55.60. 11-time South Africa National Champion (1,500, 3,000 and cross country) … Represented South Africa on the international level at the IAAF World Youth Track and Field Championship (1,500 finalist) and the World Cross Country Championship … African Cross Country Championship qualifier … Southern Region Track and Field Championship (3,000) … Southern Region Cross Country Championship. Born on April 15, 1997 … Daughter of Gerhard and Elise Viljoen … Has one brother; Daniel … Majoring in accounting.